Mahatma Gandhi (top centre) with co-founders of the Natal Indian Congress, Durban, 1895. Mahatma Gandhi with the Indian Ambulance Corps during the Boer War in South Africa, 1899-1900. Mahatma Gandhi during the early years of legal practice, Johannesburg, 1900. 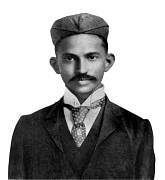 Mahatma Gandhi in South Africa, 1895. The settlers of Phoenix Settlement near Durban, South Africa, 1905. Center: Mahatma Gandhi.